Meyer will join the Code for America leadership team, and work closely with the National Advisory Council, to strengthen the network of Brigades, governments, and tech leaders making government work for the people and by the people in the 21st century. San Francisco, CA, March 30, 2017— Erie Meyer, co-founder of United States Digital Service and Tech Ladymafia, joins Code for America. Meyer will sit on the Code for America leadership team, and work closely with the National Advisory Council, to strengthen the network of Brigades, governments, and tech leaders making government work for the people and by the people in the 21st century. Code for America is a national nonprofit dedicated to the belief that government can work for the people, by the people, in the 21st century, if we all help. The organization’s mission is to make it easier for government to serve the American public, and easier for the public to improve government. 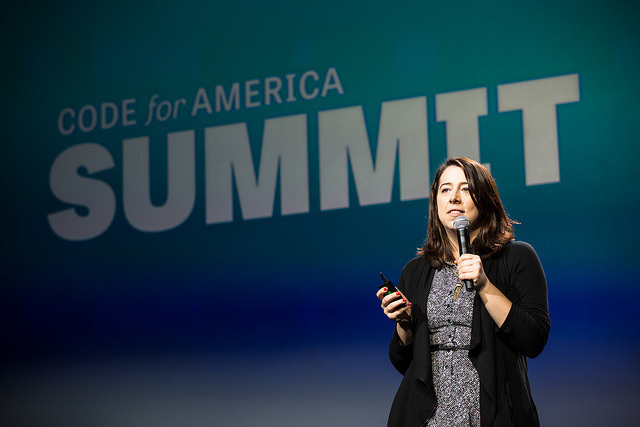 Erie Meyer at 2015 Code for America Summit. Before co-founding the United States Digital Service, Meyer was Senior Advisor to the U.S. CTO at the White House Office of Science and Technology Policy, where she worked on President Obama’s Open Data Initiatives, the Presidential Innovation Fellowship, and cross-agency efforts to improve technology in government. Meyer was named a Joan Shorenstein Fellow at the Harvard Kennedy School, where she led research on the intersection of open data, journalism, and civic life. She is a serial public entrepreneur, having served on the founding team of the Consumer Financial Protection Bureau, where she helped launch the Tech + Innovation Team. She launched a system to collect consumer complaints about financial products and services, such as students loans and credit reporting, and then to publish the data. Meyer will spend her first few months on the job meeting the volunteers who power Code for America — Brigades that represent a network of more than 60,000 tech experts, government staff, and community organizers who put technology to work for the benefit of their communities. Meyer launched one of the first open source websites in government, when she stood up the first digital office for the Ohio Attorney General. She has also been part of the strategy team at Blue State Digital, working on student loan issues for Senator Ted Kennedy and campaigns like She Should Run, a nonpartisan effort to elect more women to public office. Meyer is a co-founder of Tech Ladymafia, a group of women living everywhere from San Francisco to Shenzhen, China, working on anything from DIY circuit boards to theoretical physics. She was named one of Forbes’ “30 under 30” for technology, and her work has been featured in the New York Times, the Washington Post, CNN, the National Journal, and more. Read more about the National Advisory Council and the evolution of the Brigade network.